Click on words you don't know. Try our dictionary! More than 8 million translations in 11 languages. Get an e-mail when your dictionary is available! Lingro remembers all the words you look up, so you can easily review and study them. • Even though the bearing of a torch formed an integral aspect of Greek ceremonies, the ancient Olympic Games did not include it, nor was there a symbol formed by interconnecting rings. • Upon winning the games, the victor would have not only the prestige of being in first place but would also be presented with a crown of olive leaves. 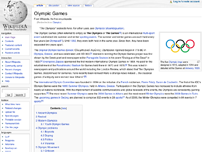 • From the 241 participants from 14 nations in 1896, the Games grew to nearly 11,100 competitors from 202 countries at the 2004 Summer Olympics in Athens. lingro is building open content dictionaries that will be free forever. You can help us by adding translations. Your contributions will be available under a Creative Commons license.